NB: la date dans la vidéo n’est pas la bonne! 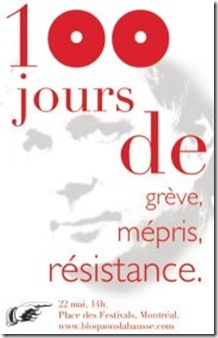 Il s’agit bien du 24 mai au soir et non pas le 26! A group of New Yorkers have taken an interest in Quebec’s student strikes and have created a documentary in the hopes of bringing the news of the tuition conflict to Americans. Lavey was inspired to make this documentary because of the dearth of coverage in the U.S.
Lavey and his team began shooting the documentary this past Saturday and worked hours on end to get it completed and online by Wednesday morning. After being unsuccessful in receiving funding from independent media outlets, they put their own money into the project. So why was it so important for them? Among other draconian elements brought forward by this law, any gathering of 50 or more people must submit their plans to the police eight hours ahead of time and must agree to any changes to the gathering’s trajectory, start time, etc. Any failure to comply with this stifling of freedom of assembly and association will be met with a fine of up to $5,000 for every participant, $35,000 for someone representing a ‘leadership’ position, or $125,000 if a union – labour or student – is deemed to be in charge. The participation of any university staff (either support staff or professors) in any student demonstration (even one that follows the police’s trajectory and instructions) is equally punishable by these fines. Promoting the violation of any of these prohibitions is considered, legally, equivalent to having violated them and is equally punishable by these crippling fines. One cannot view this law in isolation. In the past few months, the Québec student movement – inspired by Occupy, the Indignados of Spain, the students of Chile, and over 50 years of student struggle in Québec; and presently at North America’s forefront of fighting the government’s austerity agenda – has been confronted by precedent-shattering judicial and police repression in an attempt to force the end of the strike and our right to organize collectively. Our strike was voted and is re-voted every week in local general assemblies across Québec. As of May 18th, 2012, our committee has documented and is supporting 472 criminal accusations as well as 1047 ticket and penal offenses. One week in April saw over 600 arrests in three days. And those numbers only reflect those charged with an offense, without mentioning the thousands pepper sprayed and tear gassed, clubbed and beaten, detained and released. It does not mention Francis Grenier, who lost use of most of an eye when a sound grenade was illegally thrown by a police officer into his face in downtown Montreal. It does not mention Maxence Valade who lost a full eye and Alexandre Allard who clung to life in a coma on a hospital bed for days, both having received a police rubber bullet to the head in Victoriaville. And the thousands of others brutalized, terrorized, harassed and assaulted on our streets. Four students are currently being charged under provisions of the anti-terrorist laws enacted following September 11th. In addition to these criminal and penal cases, of particular concern for those of us involved in the labour movement is that anti-strike forces have filed injunctions systematically from campus to campus to prevent the enactment of strike mandates, duly and democratically voted in general assemblies. Those who have defended their strike mandates and enforced the strike are now facing Contempt of Court charges and their accompanying potential $50,000 fines and potential prison time. One of our spokespeople, Gabriel Nadeau-Dubois, will appear in Superior Court under such a charge for having dared say, on May 13th of this year, that “I find it legitimate” that students form picket lines to defend their strike. the inherent nature of the legal system means we are spending large sums of money on this defense by the day. It is in this context that we appeal to you to help us cover the costs of this, our defense. Not only must we help those being unduly criminalized and facing injunctions undermining their right to associate, but we must act now and make sure that the criminalization and judicialization of a political struggle does not work and set a precedent that endangers the right to free speech and free assembly. If you, your union, or your organization is able to give any amount of financial help, it would make an undeniable difference in our struggle. In addition to the outpouring of support from labour across Quebec, we have already begun to receive trans-Canadian and international solidarity donations. We thank you for adding your organization’s support to the list. If you have any questions, please contact us via email legal AT asse-solidarité.qc.ca. Telephone numbers can be given to you in a private message. You can also send you donation directly to the order of “Association pour une solidarité syndicale étudiante” (2065 rue Parthenais, Bureau 383, Montréal, QC, H2K 3T1) noting “CLASSE Legal Committee” in the memo line. Education ministers from across Europe met in Kyiv (Ukraine) for the so-called Forum of European Education Ministers hosted by the Ukrainian government today. Since people in the Ukraine struggle against the increasing commercialisation of education just like everyone else around the world, some students decided that this meeting could not just take place silently. More than 100 students gathered to voice their opposition to the dominant education policies in the Ukraine and across Europe. The protesters were faced with a massive police presence: even riot police was to keep the students from voicing their opposition. The police was aggressive and at some stage attacked protesters. Four activists, three of whom are members of Direct Action (a network of independent student trade unions), were detained. The police “offered” to release them in exchange for everyone to stop protesting. But since they saw that this “offer” had no effect, the activists were fortunately released a few minutes later. The Direct Action network planned to hold a students’ counter-forum (“The Other Side of Education”) during these days, but it was prohibited by a court ruling. Obviously this decision is in violation of the freedom of assembly. According to the law, this freedom can only be restricted if there is a direct threat to national security or public order. 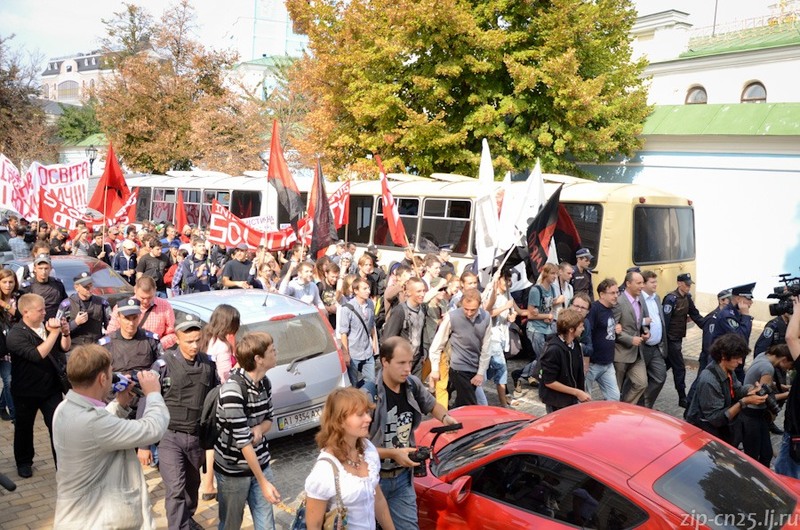 Since “The Other Side of Education” was prohibited, students decided not to set up an encampment as planned, but to march through the city center of Kyiv instead. The current education reforms in the Ukraine (like in most other parts of the world) are aimed at cutting public spending on education and further commercialization of the education system as a whole. This would make it harder for the financially poorer parts of society to attain an university degree. Photo by zip-cn2. See their complete photo reportage of the counter forum here. One of our valued comrades and partner of a UC graduate was severely beaten by police inside Tolman Hall last night, while he cried out repeatedly, “please stop hurting me.” As a matter of course, he was issued severe charges; the more the police injure someone, the worse the charges must be so as to justify their violence. There is little doubt that he will not be convicted, should this go to trial. However, because his injuries were severe and he had been denied medical attention at the UCPD building nor at Santa Rita, his partner felt it was imperative to get him out as swiftly as possible. This meant posting bond rather than the $15,000 bail, and forfeiting the $1,500. The good news is that his partner just started a community care job this week that provides medical insurance; she told me this, tearfully but wryly, last night. The bad news is that she is currently broke. She managed to get the necessary amount from her family, but they themselves are quite poor. As a result, we are taking up a collection to help repay them some or all of the amount, and asking for your support. Please understand: because this was bond and not bail, any donations will be exactly that; it won’t be returned at trial. We are grateful for contributions of any amount. Please contact Joshua Clover (jclover@ucdavis.edu) if you are able to help with this, and we’ll make arrangements about gathering what we can — and we’ll repeat our thanks, both in specific and for the strength of our shared friendships. On September 22, heads of European departments of education are coming to Kyiv, Ukraine, to specify their own goals and priorities for educational and cultural field during the next few decades. We all know what can be the outcome of these forums—commercialisation, budget cuts, strict centralisation—these things happen all over Europe, and this is their side of education. No wonder the heads of educational departments come to Kyiv intending to decide the fate of education together. The probblems of Ukrainian students are similar to those of the students in most European and post-Soviet countries—governmental efforts to make education self-sufficient, putting obstacles in the way of the needy to get educated; cuts in financing of liberal arts, binding researches to commercial profit—all these aspects follow the neoliberal reforms, i.e. governmental cuts in social sectors. We can see the other side of modern education, and it is far less attractive than the pretty picture the officials are trying to present us. Yet we are the other force, the only force that can change the situation. As opposed to the official forum of the heads of departments students plan to hold an alternative forum in Kyiv, in order to draw attention to the other side of the problems discussed by the officials. If we don’t interfere, they will decide that the aim of education must be to produce narrow professionals for commercially profitable industrial areas, and the priorities in education must be focused on business! We also know what hypocrites they are when they talk of fighting against xenophobia—because it is they who create the conditions for xenophobia: it is caused by the social and economic conditions that people experience. Educational politics makes education unavailable for the majority, which deepens social inequality and results in xenophobia—the psychological need of the oppressed to find some alien who sticks out and blame him for all evil. In contrast to liberal “fighting” against xenophobia, we act in real international solidarity, which is proved by our alternative forum. On September 22-23, students from different countries are coming to hold an alternative forum. The forum will consist of a number of events, connected with common ideas of opposition to commercialization of education and prevention of xenophobia. We will take advantage of the fact that the objects of our criticism will all be in Kyiv to tell them what we think education and culture must be like in the coming decades. We will take the opportunity to occupy the information space to tell European community what modern education is really like nowadays, to show the real reasons of xenophobia, and draw the way in which education can be different, the way it can promote equality and freedom of personality. We can see the dark side of education, and we will bring the officials to daylight! Come to our side!